It is a maxim universally admitted in geometry, and indeed in every branch of knowledge, that in the progress of investigation, we should proceed from known facts to what is unknown. In early infancy, our ideas spring from our wants; the sensation of want excites the idea of the object by which it is to be gratified. In this manner, from a series of sensations, observations, and analyses, a successive train of ideas arises, so linked to­gether that an attentive observer may trace back to a certain point the order and connection of the whole sum of human knowledge. When we begin the study of any science, we are in a situation, respecting that science, similar to that of children; and the course by which we have to advance is precisely the same that nature follows in the formation of their ideas. In a child, the idea is merely an effect produced by a sensation; and in the same manner, in commencing the study of a physical science, we ought to form no idea but what is a necessary consequence and immediate effect of an experiment or observation. Besides, he that enters on the career of science is in a less advantageous situation than a child who is acquiring his first ideas. To the child, nature gives various means of rectifying any mistakes he may commit respecting the salutary or hurtful qualities of the objects that surround him. On every occasion, his judgments are corrected by experience; want and pain are the necessary consequences arising from false judgment; gratification and pleasure are produced by judging aright. Under such matters, we cannot fail to become well informed; and we soon learn to reason justly when want and pain are the necessary consequences of a contrary conduct. 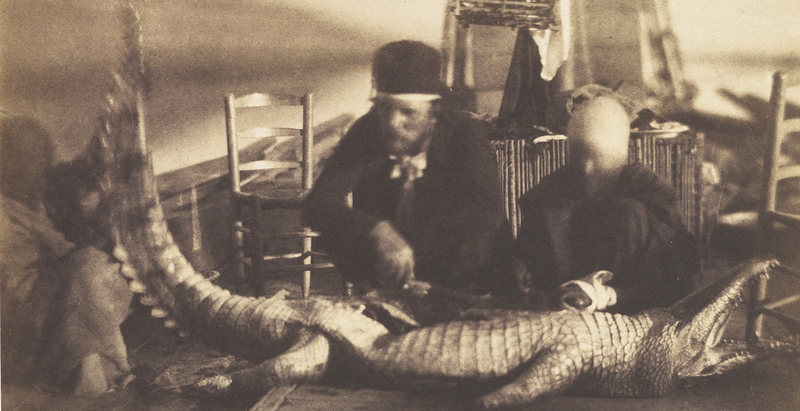 Autopsy of the First Crocodile, Onboard, Upper Egypt, by Ernest Benecke, 1852. Benecke’s amateur photographs, taken while on a grand tour of Egypt and the Mediterranean, arguably make him the world’s first ethnographic photographer. The Metropolitan Museum of Art, Gilman Collection, Purchase, William Talbott Hillman Foundation Gift, 2005. In the study and practice of the sciences, it is quite different; the false judgments we form neither affect our existence nor our welfare; and we are not forced by any physical necessity to correct them. Imagination, on the contrary, which is ever wandering beyond the bounds of truth, joined to self-love and that self-confidence we are so apt to indulge, prompt us to draw conclusions that are not immediately derived from facts, so that we become in some measure interested in deceiving ourselves. Hence it is by no means to be wondered that in the science of physics in general, men have often made suppositions, instead of forming conclusions. These suppositions, handed down from one age to another, acquire additional weight from the authorities by which they are supported, till at last they are received, even by men of genius, as fundamental truths. The only method of preventing such errors from taking place, and of correcting them when formed, is to restrain and simplify our reasoning as much as possible. This depends entirely on ourselves, and the neglect of it is the only source of our mistakes. We must trust to nothing but facts. These are presented to us by nature and cannot deceive. We ought in every instance to submit our reasoning to the test of experiment and never to search for truth but by the natural road of experiment and observation. Thus mathematicians obtain the solution of a problem by the mere arrangement of data and by reducing their reasoning to such simple steps, to conclusions so very obvious, as never to lose sight of the evidence that guides them.